By contrast, Hawaii gubernatorial challenger Colleen Hanabusa is too cozy with special interests. In 2002, the League of Women Voters, taro farmers and environmental groups objected to the nomination of Alexander and Baldwin’s vice president and lobbyist to sit on the state’s Commission On Water Resources Management. After all, the commission is charged with protecting our streams and A&B diverted more water from our streams than anyone else. A&B’s diversions left many streams bone dry, depriving taro farmers and fish of the water they needed to survive. Colleen Hanabusa voted to allow the A&B lobbyist to play a key role in regulating our water. Unsurprisingly, the commission allowed A&B to continue to divert water from free-flowing streams for years. In contrast, the Water Commission under Gov. David Ige’s leadership has voted to fully restore many streams to their natural state. Exercising a balanced approach — something that has been missing for decades — the commission has finally taken steps to protect the public interest. It has been able to do so, in part, because A&B and other corporate interests no longer control the Water Commission. The author says that Gov. 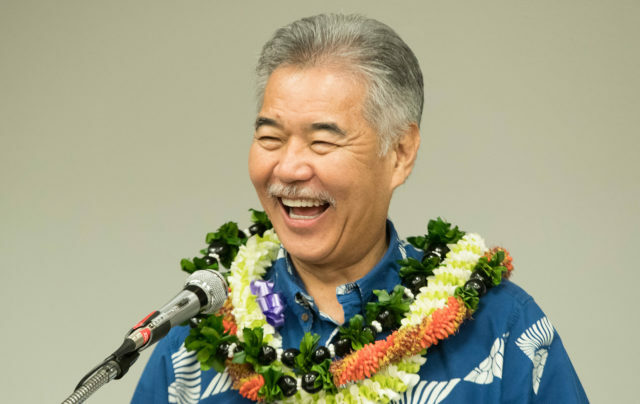 David Ige, while not an environmental “superhero,” has nonetheless made the right calls when it comes to protecting Hawaii’s natural resources. Hanabusa’s championing of an A&B lobbyist to serve on our Water Commission is one of many examples of her embrace of special interests. In 2003, a political insider faced Honolulu City Council and Hawaii Health Department opposition to his plans to build a landfill directly over our drinking water aquifer. So, he lobbied for Senate Bill 1532 to change state law in a way that would allow his proposed landfill to be constructed. Colleen Hanabusa voted for this special interest legislation. David Ige opposed the bill. Gov. Ige supported the expansion of Papahanaumokuakea Marine National Monument to protect the pristine ecosystem. At the behest of the fishing industry, Colleen Hanabusa opposed it. When Florida-based NextEra tried to buy Hawaiian Electric, it showered lobbyists, political insiders and politicians with cash. Gov. Ige, realizing that a mainland corporate takeover of Hawaiian Electric was not in the public interest, opposed the deal. NextEra would have sucked profits out of the state, compromised jobs and institutionalized the importing of fossil fuels. NextEra has embraced Colleen Hanabusa. Hawaii Gas Company has impeded efforts to accelerate the use of solar water heating and opposed efforts to increase the use of renewable energy. It has lobbied to dramatically increase imports of fracked gas to Hawaii. On June 4, 2015, Hawaii Gas Company issued a press release proudly welcoming Colleen Hanabusa to its board of directors. The chairman of the fossil fuel company expressed his excitement in working with her. Ige has opposed efforts to make Hawaii more dependent on gas. He has opposed efforts to make Hawaii more dependent on gas. These contrasts are illustrative of the differences between David Ige and Colleen Hanabusa. That is not to say that Ige is some environmental superhero. After all, the environmental community has loudly and publicly disagreed with Gov. Ige on several issues. Unlike previous governors, however, he has never acted vindictively. He has continued to discuss concerns with those who have publicly criticized some of his decisions. Nor is to say that Hanabusa is a surrogate for Donald Trump. But her coziness with special interests is disturbing. As a state senator, Colleen Hanabusa went to extraordinary lengths to grease the wheels for political insiders Jeff Stone, Ko Olina, Henry Peters and Dickie Wong. Her support for A&B’s lobbyist, Hawaii Gas and a waste management company are further evidence of a troubling pattern. Currying favor with special interests is not leadership. Gov. Ige represents a better way.